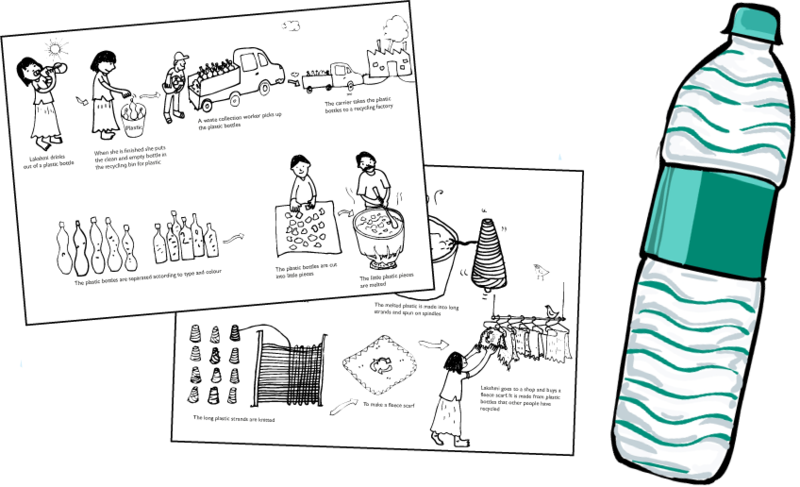 This page provides you with a snapshot of this activity that gets students to investigate what happens to a plastic bottle, where it comes from and where it ends up. Follow the story of a plastic bottle and find out how it travels and what happens to it once you have finished using it. You will need to make photocopies of the handout ‘Follow that Bottle’ for each student (2 pages in A4). Bring a plastic water bottle (PET bottle) as a sample. Start a class discussion on recycling. Let students come up with their own answers. Recycle means to use over and over again. Let students know that when we recycle an item/product, it does not add to our waste but becomes something new. For things to be recycled, they need to be separated into different categories such as plastic, paper, glass, metal and organic. It is important that you put a waste item in the right bin; therefore, it is important to know which waste item belongs to which bin.